Sometimes some of the most wonderful things just seem to happen. I think those are the things we appreciate the most. 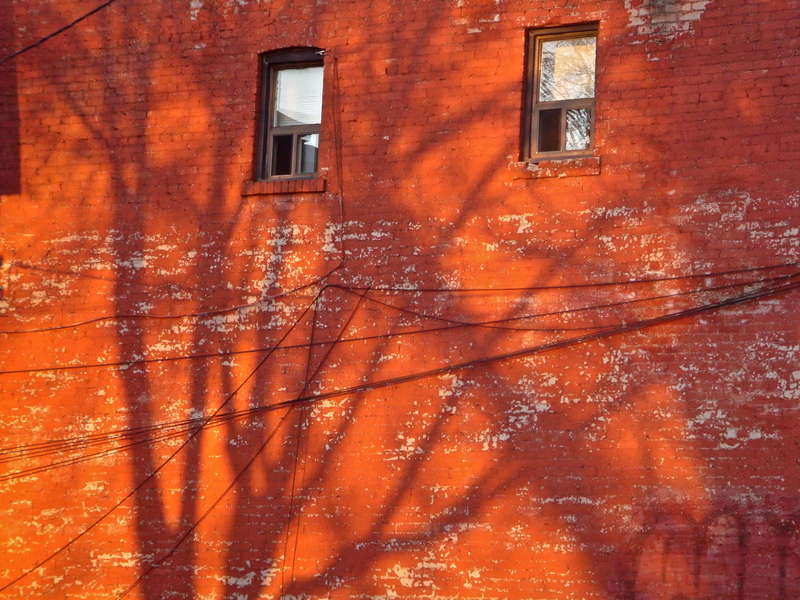 What a gorgeous rusty-red bathed in golden sunlight. And don’t you love it when you find a surprise in your image – like your tree reflections in the window? What fun!! Such gorgeous color and light! That’s too funny. And such a cool image. I’m glad the sun popped out at the right time, for your sake and ours. This is truly the moment of being at the right place at the right time – too perfection. Beautiful image! So glad you saw this and were able to capture it! I love the shadows!! It looks as though the house has a face. I love when I find buildings that show faces to me, it always seems like they’re smiling at me for “finding” them. : ) Merry Christmas to you, too! I really like this capture! The textures, patterns, and cast shadows – all great!